Licensed hair stylists work with their clients to create wonderful and unique looks for every day or their most special events. If this sounds appealing to you, you may want to pursue certification through a licensed school of cosmetology. 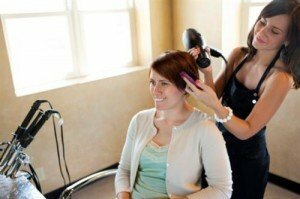 What Is a Licensed Hair Stylist? A licensed hair stylist is a stylist certified by the board of cosmetology within their state as someone who has gone through the appropriate training to cut, style and color hair. Licensed stylists consult with their clients in regards to the style they desire and then will shampoo hair, cut it, perm it, frost it and perform various other treatments such as hot oil treatments, curling and blow drying. Stylists may gradually learn techniques such as Brazilian blowouts and cold perms. A licensed hair stylist needs to be able to deconstruct and replicate styles based on photographs and descriptions, and also to advise clients on the proper styles for their facial structure and body. Often a licensed hair stylist will need to keep updated on the newest and most fashionable styles and treatments for their clients. What Does a Licensed Hair Stylist Do? A licensed hair stylist will usually work in a salon with other hair stylists. The stylist will usually be employed directly by the salon but may also lease a space. Most stylists set their own hours and availability, making it a particularly flexible profession. Stylists will work for a flat rate as well as cash tips and can make a significant amount of money per hour depending on their experience and their clientele. Usually a stylist working with a salon will be working under the direction of a supervisor called a "master stylist." The stylist will usually begin by discussing the client’s needs. Occasionally a stylist may be called upon to perform styling for a specific event or occasion, but more often the stylist will be developing the style that the individual will stick to for casual wear. Stylists may need to take certain things into consideration, such as their client’s lifestyle and how long they can spend on their hair in the mornings. How Do You Become a Licensed Hair Stylist? Becoming a licensed hair stylist requires the completion of training in an accredited cosmetology program. A cosmetology program can be completed within a year and is normally fairly flexible, allowing students to attend either full-time or part-time. Once the cosmetology program is completed the hair stylist usually needs a certain amount of time in a salon before they can be licensed by a board. Different states have different regulations, such as the Tennessee Board of Cosmetology which requires a written and practical examination. A newly licensed hair stylist will usually begin by work or apprenticeship in a salon. Stylists usually begin with the simple tasks such as deep conditioning treatments and then work their way up to progressively more complex tasks such as coloring and perming. Perm treatments in particular can be very complex and are usually only done by those that have experience as a hair stylist. How Do You Advance as a Licensed Hair Stylist? Hair stylists advance within a salon by gaining experience and successfully performing more advanced techniques. Stylists may gradually learn techniques such as Brazilian blowouts and cold perms. As a stylist advances, they will often get clients that want these expensive treatments and thus may end up being tipped and paid higher amounts for their service. Beyond this, the hair stylist may build their income by acquiring clients that come specifically to them. Stylists often open up their own salons eventually, and the Bureau of Labor Statistics notes that almost half of those within the hair styling and cosmetology industry are entirely self-employed.